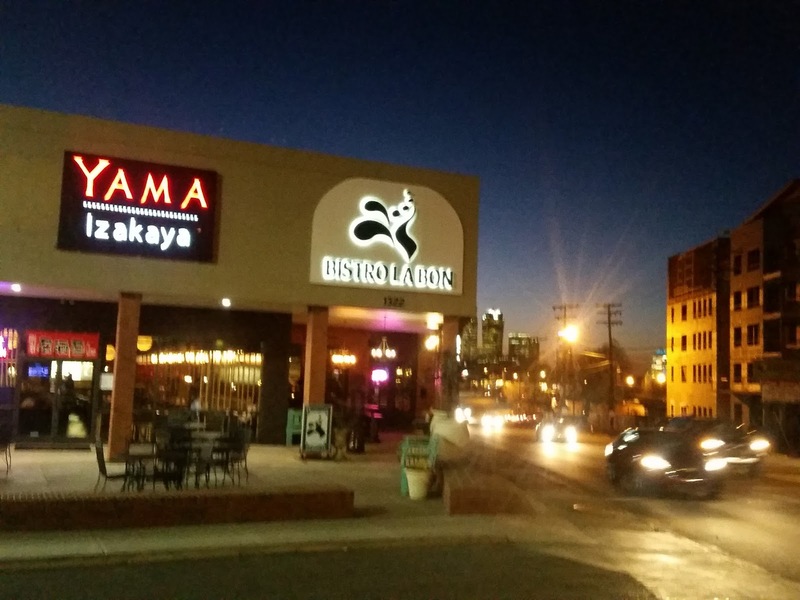 This edition of Excited about Eating takes us to Yama Izakaya, a Japanese tavern in the Midwood neighborhood of Charlotte on a rare dinner review. This small and trendy restaurant is tucked into a shopping center, so parking is not a problem. 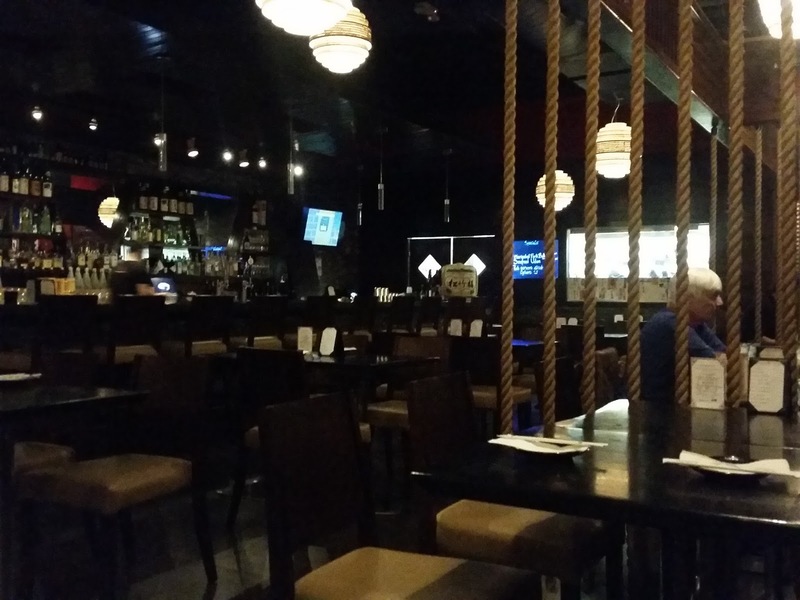 They offer a variety of small plates, specialty dishes, and the main dish that called us, ramen. After our first experience with ramen in DC, we planned to share, so we started with a couple small plates. 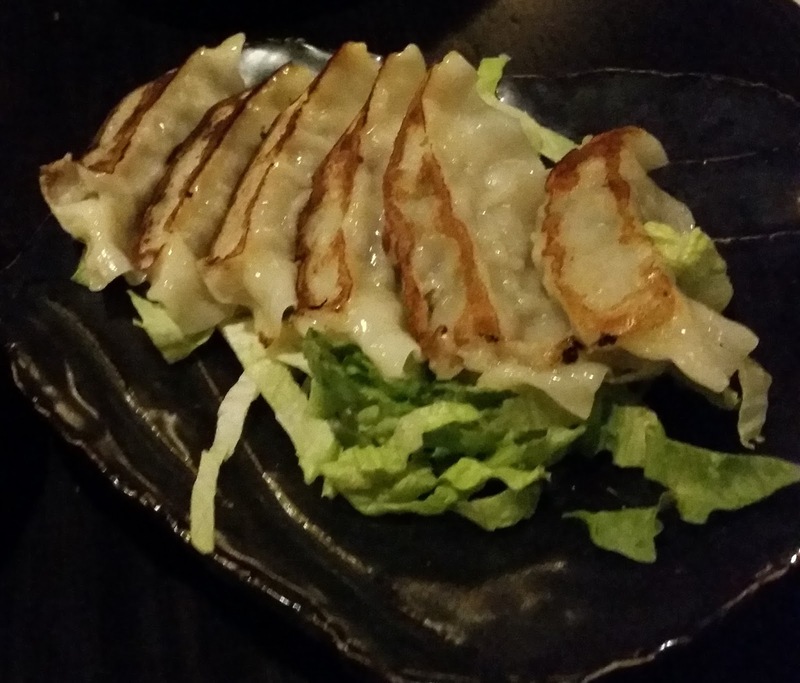 First up was the Gyoza, pan-fried pork dumplings. Soft on the outside, tender and full of favor on the inside, and served with a Japanese dipping sauce that would have been great on anything. Dora here. Light, delicate, delicious! Gyoza, pork dumplings. Light, delicate, delicious! 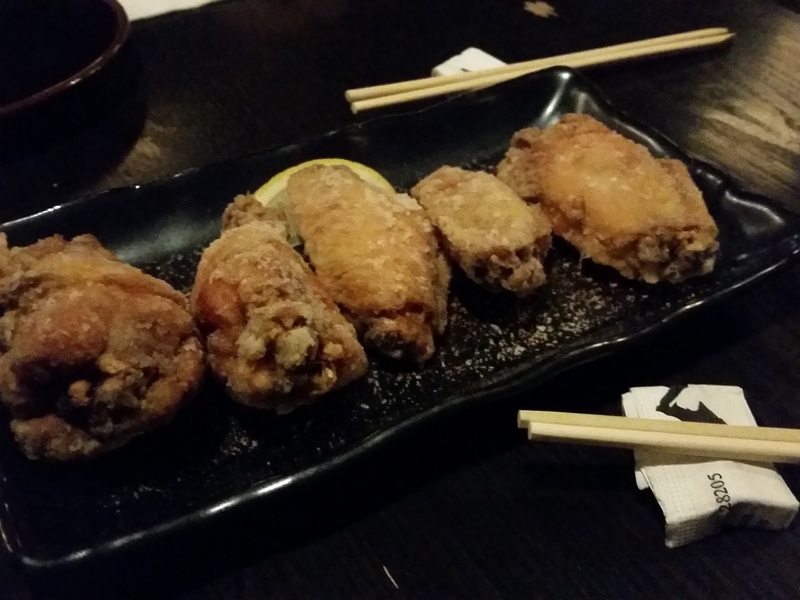 We also tried the Fried Chicken Wings. They appeared to be like typical chicken wings until I took the first bite. The waiter told us they were seasoned with a Korean chili spice. Whatever it was, they definitely had a unique favor and were crispy and juicy. Dora here. I wish I was a fan of chicken wings because they always smell delicious! I gave these a try, but they didn’t tempt me with a second bite. Now if you have never tasted ramen, you are missing out. 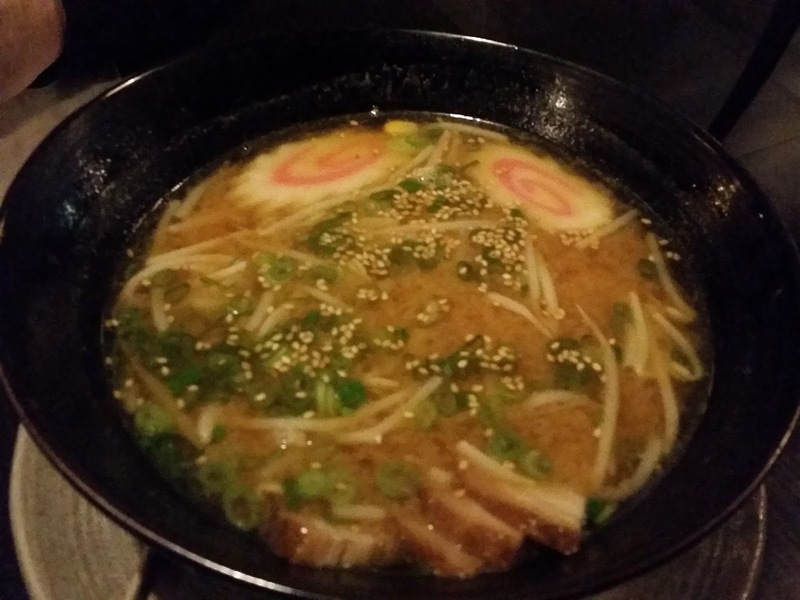 Ramen is an Asian-style soup with noodles, and we chose the Miso Ramen. Marinated Braised Pork Belly (chashu), seaweed (nori), sesame seeds, scallions, bamboo shoots (menma), seasoned egg (sometimes called a Ramen egg), corn, and colorful fish cakes. The ramen was very good and the taste of the pork and seafood rose above everything else. Miso Ramen. Huge portions! Plan to share. Dora here. Don’t let all the names scare you. It’s just a soup with some deliciously flavorful elements. Tasty, warm, and a wonderful go-to comfort food in winter. This photo really doesn’t do the serving size justice. It’s a HUGE bowl! We ordered extra toppings in DC, but forgot to do that this time. If you plan to share, adding extra toppings might make it a bit beefier, er…porkier. 🙂 Oh, and the restaurant rates this “spicy.” Maybe a little kick but definitely not a forehead slicker. Go for it! What about you? Have you tried ramen or pork dumplings? Do the pics look yummy? Would you give it a go after reading this review? ← Tomorrow’s Forecast: Clear Sky! You can't head here for breakfast. Sadly, they are only open for dinner. Toasty? Egads, is that a 78 I see rudely interrupting our spring? lol. Wishing you the same, my friend. Enjoy your weekend. The food looks yummy. The pork dumplings do sound delicious. Wishing you a fabulous weekend, Ann! Thanks Jill, our son got us eating Ramen in DC and we love it. Thanks Ann, the food was great and we always try the pork dumplings when we visit a Ramen place.